David W. Griffith Corporation production; distributed by Epoch Producing Corporation. / Produced by David Wark Griffith. Scenario by D.W. Griffith and Frank E. Woods + [Thomas Dixon Jr.], from the play adaptation The Clansman by Thomas Dixon Jr. of the novel The Clansman: An Historical Romance of the Ku Klux Klan by Thomas Dixon Jr. and from the novel The Leopard’s Spots by Thomas Dixon Jr. Costume design by Robert Goldstein and Claire West. Assistant directors, Thomas E. O’Brien and George André Beranger (André Beranger), with George Siegmann, Raoul Walsh, W.S. Van Dyke, Erich von Stroheim, Jack Conway and Thomas Wilson (Tom Wilson). Cinematography by G.W. Bitzer. Camera assistant, Karl Brown. Edited by James Smith and D.W. Griffith. Original music score by Joseph Carl Breil + [D.W. Griffith]. / © 8 February 1915 (at 12 reels) by Epoch Producing Corporation and Thomas Dixon [LP6677]. 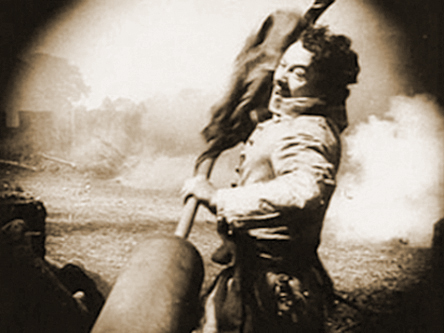 © 13 February 1915 by David W. Griffith Corporation as The Birth of a Nation: or The Clansman [LU4453]. Test preview screening, 1 January 1915 as The Clansman in Riverside, California. World premiere, as The Clansman, 8 February 1915 at Clunes Auditorium in Los Angeles, California. Original length was 180 minutes (13,058 feet), later cut to 165 minutes (12,500 feet). New York preview, 20 February 1915 at the Rose Gardens in New York, New York. Premiered as The Birth of a Nation, 3 March 1915 at the Liberty Theatre in New York, New York. / Standard 35mm spherical 1.33:1 format. / In 1911, the Kinemacolor Company of America began shooting a feature-length color version of The Clansman under the direction of William Haddock — after spending approximately $25,000 the project was abandoned because of the inherent (production-company imposed) problem of matching footage from different location performances of the touring company of The Clansman — the project was abandoned before shooting was completed. Frank Woods was then the editor of the Motion Picture News and saw the Kinemacolor footage; he later worked on Griffith’s version. Von Stroheim appeared in the film in blackface. Original sequences were presented with color by the Max Handschiegl hand color engraving process. The final production cost was approximately $100,000. In 1916, an illegal three reel version of the film was released as In the Clutches of the Ku Klux Klan — a successful lawsuit stopped further distribution. New music score for the 1921 rerelease arranged by S.L. Rothafel, Erno Rapée, William Axt and Hermann Hand. The film was rereleased by United Artists Corporation on 15 February 1923. [?] The film may have been rereleased in the USA by Arthur C. Bromberg Attractions circa 1926. D.W. Griffith and Walter Huston appear in a brief interview prologue shot for the 1930 sound reissue. The Museum of Modern Art film archive holds the negative previously owned by D.W. Griffith. American Film Institute later restored the sound prologue and a color toned print. Surviving footage of outtakes and behind-the-scenes shots are in the Library of Congress film archive. Synopsis: Synopsis available in AFI-F1 n. F1.0337. Survival status: Prints exist in the Library of Congress film archive [35mm nitrate outtake footage]; in the George Eastman Museum film archive [35mm positive]; in the Museum of Modern Art film archive [35mm nitrate negative]; in the film holdings of Cohen Media Group (Raymond Rohauer collection) [35mm positive]; and in private film collections [16mm reduction positives, 8mm reduction positives]. Listing updated: 1 September 2018. References: Film credits, film viewing : AFI-F1 n. F1.0337; Altman-Sound p. 10; Amberg-NYTimes pp. 3, 4; Baer-Film pp. 25, 48; Bardèche-History pp. ii, 98a, 99-100, 104, 108, 114, 142, 201, 202, 307, 387; Barry-Griffith pp. 19-20, 23, 26, 28-30, 32, 33, 37, 38, 40, 44, 47-48, 49, 52, 63, 68, 70, 71, 73, 80, 85, 88; Basten-Technicolor p. 14; Bogdanovich-Dwan pp. 7, 62; Bohn-Light pp. xix, 39, 41, 52, 53, 55-56, 57, 59, 74, 81, 86, 114, 139, 175, 200, 216, 226, 369; Brownlow-Behind pp. xix, 17; Brownlow-Parade pp. 22, 26, 42, 45, 46, 47-49, 56, 59, 62, 78, 82, 217, 224, 264, 281, 388, 432, 488, 510, 536, 541; Card-Seductive pp. 32, 40, 42-44, 59, 62, 74; Carroll-Matinee p. 118; Cooper-Dark pp. 1, 3, 4, 21, 34, 39, 52, 55, 56e, 62-64, 68, 71-74, 77-81, 84-89, 93, 95, 96, 99, 106-110, 112, 126, 133, 141, 144, 153, 161, 182, 184b, 197, 211, 241, 243; Cowie-Swedish-2 p. 9; Dardis-Keaton pp. 31, 47, 138; Dowd-Vidor pp. 11, 18, 38; Drew-Speaking pp. 164, 219, 225, 243; Edmonds-BigU pp. 36, 156; Everson-American pp. 5, 9, 18, 45, 49, 50, 53, 54, 55, 56, 65, 67, 70, 76, 77-78, 79-86, 86g, 87-88, 90, 91-92, 93, 94, 95, 96, 97, 98, 99, 100, 104, 107, 113, 114, 139, 148, 152, 157, 158, 172, 179, 181, 188, 189, 195, 212, 213, 215, 216, 300, 317, 350, 359, 369; Fell-History pp. 56, 63, 64-67, 69, 82, 113; Gallagher-Ford pp. 9, 14, 15, 22, 103, 121, 452; Geduld-Birth pp. 36, 38; Higashi-Virgins pp. 4-6, 8, 14, 20, 55; Jewell-RKO p. 164; Kael-Kiss p. 131; Kerr-Silent pp. 7, 22, 32, 41, 44, 59; Keylin-NYTimes p. 27; Lahue-Collecting pp. 20, 27, 48, 49, 89, 123, 135; Lahue-Gentlemen p. 146; Lahue-Kops pp. 65, 70, 71; Lahue-Selig p. 223; Lahue-Triangle pp. 32, 48, 66, 69, 70, 71, 82, 84, 96, 119, 120, 128, 145, 202; Lee-Not pp. 11, 25; Leish-Cinema pp. 23-24; Leyda-Before pp. 72, 144; Limbacher-Feature p. 23; LoC-MoPic-2 p. 69; Maeder-Hollywood pp. 10, 220; Maltin-Guide p. 118; Maltin-Selected p. 1; McCaffrey-Guide pp. 6, 8; McGhee-Wayne p. 96; McIlroy-Ireland p. 12; Musser-Emerge pp. 219, 598; Nollen-Karloff p. 33; Null-Black pp. 9, 12, 13, 14, 24; Perry-British p. 40; Pitts-Hollywood pp. 2, 4, 5, 6, 8, 40, 44-45, 61-66, 139; Ramsaye-Million pp. 86, 134, 265; Robinson-Palace pp. 129, 130; Ryall-Blackmail p. 61; Shipman-Cinema pp. 55, 58, 75; Shirley-Australian p. 44; Sinyard-Silent pp. 20, 24, 25-26, 27, 28, 55, 116, 139, 141, 183; Sklar-Movie pp. 50, 57-61, 63, 71, 114, 143; Skretvedt-LaurelHardy p. 438; Slide-Aspects pp. 22, 38; Slide-Early p. 8; Slide-FineArts pp. vii, 1, 2, 7, 14, 16, 18, 19, 20, 27, 47, 48, 49, 67, 71, 78, 88, 113, 118, 119, 138, 141, 142, 144, 150, 156, 159, 183, 187, 192, 193, 194, 197, 198, 208, 215; Sloan-Loud pp. 45, 47, 146; Smith-Colman pp. 92, 187; Smith-Epic p. 116; Stedman-Serials p. 10; Tarbox-Lost pp. 239, 242, 245; Taylor-Hitchcock p. 41; Usai-Griffith-1 p. 24; Vermilye-Twenties p. 215; Weaver-Twenty pp. 28, 146; Webb-Hollywood pp. 20, 33-34, 41, 126, 201; Weinberg-Lubitsch p. 324 : ClasIm-220 p. 36; ClasIm-221 p. 33 : Documentary-Beecher; Documentary-Cram : Website-GEM; Website-IMDb. Home video: Blu-ray Disc, DVD.